Took me forever to get this out. I did these yesterday, but it took me three hours to get down to writing this entry because I couldn't quite figure out what colour to call it. Drove me nuts! And then I figured I would wait a day to try and get sunlight pictures to figure out the colour, but it was cloudy all day ending with snow that's more or less shut down the city. Brutal outside right now. So anyway, in the right light, this looks brown, in another light this looks grey. So I'm just going to call it a brownish grey and get it over with. It's got holo particles, but definitely not as much as the original. (For anyone unaware of the difference of new and old, I shall refer you to The Polish Addict.) I'm never really sure what to call a holo. Is it a glitter or a shimmer? It shines like a glitter but removes like a shimmer. Answers? Anyhow, here are the pictures for y'all. OPI My Private Jet in indirect sunlight. In other words, there was no sun out and I tried to make the best of the dreary weather situation. 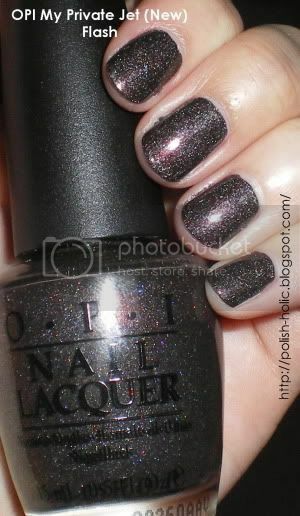 OPI My Private Jet with flash, because you ain't gonna see sparkly any other way. 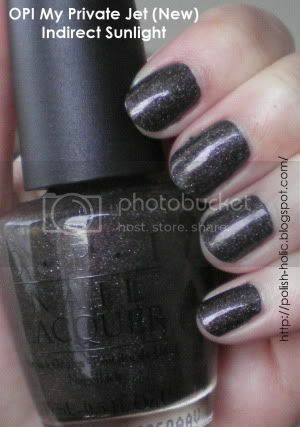 This is two coats and as the sun hasn't been out, I really haven't seen much of the holo effect. Just sorta sparkly, but it hasn't gone all nice and holo-sparkly on me yet. I honestly think if you can't get an old bottle of Private Jet, don't bother. Go for Color Club's Revvvolution instead. Actually, just go with Revvvolution instead. The old formula required something like four coats. Revvvolution only needs one for full coverage. The only thing the new Private Jet has going for it is its fantastic brush. I'm not sure if you've figured out yet, but I love OPI's pro wide brush. I might change my mind if I get some sunlight, I'll let you know. Reminder: Drop by December 1st! Edit: I totally managed to get a sunlight picture today. Whoo! I have to say, it looks much better than it does in the picture. "It shines like a glitter but removes like a shimmer." What do you mean removes like a shimmer? It wipes off along with your polish, unlike glitter, which will stick to your nail despite the fact that all the polish is off. I hope Revvvolution removes so easily as I have some winging it's way towards me. This does look gorgeous though!